Spam, one of the biggest issues with any WordPress site. So much so that Automattic even include the Akismet plugin with every WordPress file. But is Akismet really the best option? Yes it’s the most downloaded WordPress plugin. Yes it’s effective in stopping spam. But is there something better? Something that does that bit more than Akismet and with a lower price tag? That’s when I came across Anti-Spam by CleanTalk. Below I’ll be introducing you to this plugin; how to use it, what it offers and at what cost (if you can even call it a cost). Then to really test it out, I put it through its paces on this very website (www.wpmayor.com) in place of the current anti-spam plugin we use, Akismet. You can check out the results below. As I mentioned above the most popular anti-spam plugin for WordPress is currently Akismet, possibly helped by the fact that it’s shipped out with every WordPress install. But Anti-Spam by CleanTalk is a very valuable competitor. CleanTalk created a plugin that offers a cloud-based service that stops spam comments, spam sign-ups, spam contact emails and even spam trackbacks. There are no CAPTCHAs or maths equations or puzzles for your users to solve before submitting a comment or signing up. These processes are known to put off visitors and hinder your engagement numbers, so CleanTalk sought to eradicate them from the anti-spam process. In fact, the whole plugin is completely hidden to website visitors, encouraging them to engage with your site at will. If you’re worried about how it integrates with other 3rd party plugins, there’s no need. This plugin integrates smoothly with many popular WordPress plugins such as JetPack, BuddyPress, bbPress, WooCommerce, Contact Form 7, Ninja Forms and more. How does it prevent all this spam you ask? Well, it’s a pretty clever little plugin. Firstly, since it doesn’t rely on CAPTCHA or any other annoying puzzle, it has a few other ways to weed out the bots from the humans. First of all, CleanTalk use a database of blocked IPs and blocked emails that it checks submissions against every single time. These are accumulated from various sources throughout the web to ensure no bots get through. They also use the simple notion that bots reply a lot quicker than humans do. So if you submit a comment a few seconds after something is posted, you’re clearly not human. These methods stop a lot of spam comments, and if any adventurous ones get through they’re quickly transferred to the spam folder. 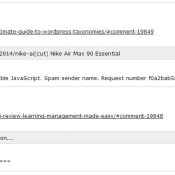 It foils all attempts to spam up your site. But how does it evaluate whether a message is relative or not? Simple; it compares the content of the message text with the subject, keywords and context of your website. If you consider other messages such as “Great post!” to be spam too, well that’s something that the plugin probably won’t pick up. But who doesn’t want praise for their work? Getting Anti-Spam by CleanTalk all set up is a quick and painless process. First download it from the WordPress plugin repository and install it. 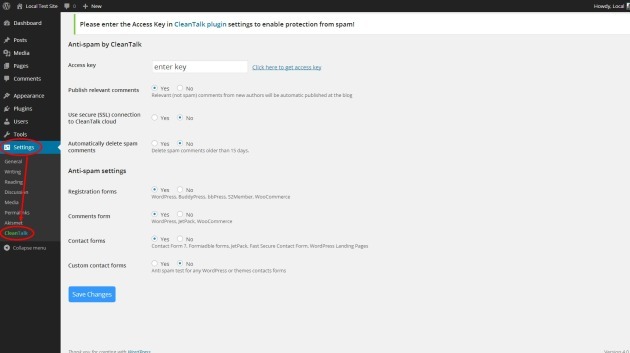 Next activate the plugin and you’ll find CleanTalk under the Settings tab in the WordPress dashboard. Once here you’re asked for an access key. Click on the link and submit your email address and website as asked. All you’ll need to do now is copy and paste the access key and your registration is complete. Now it’s just a case of using the settings you want from the list shown above. You’ve got a choice of settings ranging from deleting spam comments older than 15 days to whether you want the plugin to work for registration forms, comments, contact forms or even custom contact forms. 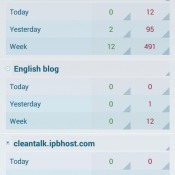 Now you’re free to head to the CleanTalk website and log in to your dashboard. From this control panel you can see which sites are set up with Anti-Spam and you’re given a few extra features too. First of all from the homepage seen above you’ll be able to see some basic statistics. For more detailed ones though you can head to the Analytics section. Here you’ll find a graph showing the number of spam comments and legitimate ones. You’re even given the stats for these for the past week, past month as well as all time. For more detail about the comments marked as spam you can head to the Log section where you’ll find a list of the comments together with the reasons for which they were marked as spam. Finally you’ve got a Settings tab that you can see open below. From here you can add your site’s URL, CMS and more. Doing all that I mentioned above is already impressive for a simple plugin, but there’s more. CleanTalk have gone the extra mile to set up free mobile apps for iPhone and Android to view all your traffic and spam statistics for the past 7 days right on your phone at any time. 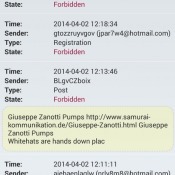 In addition to that, you get daily and weekly anti-spam reports showing you the traffic versus the spam. Both these services keep you in touch with what’s going on with your site without having to visit the CleanTalk dashboard every single time. So as I said in the introduction, I tested this plugin properly by installing it on this very website. Let’s have a look at how it performed. As you can see it did a pretty good job picking up spam. But having gone through the logs (which you can see snippets of below) I found a few mistakes. I have to say that any and all spamcomments were caught and marked immediately as spam. However, there was one legitimate comment that was marked as spam and also some email addresses that were not marked as such. From what I saw in their forums, the blacklist is constantly being updated. 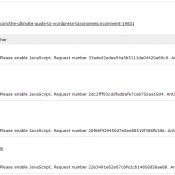 This means that some email addresses might indeed get through, but you can report these as spam from within the logs themselves and, once checked by the team, they’ll be added to the blacklist. So overall, taking into consideration the price, it was a pretty good performance for the first week. With the level of protection offered by Anti-Spam you’d expect it to be rather costly, but it only costs $8 per year. You’re free to try it out for Free for 14 days before you make your choice, and you’ll have all the premium features mentioned above, no exceptions. If you want to purchase the plugin for more than one site their prices still remain very low. Check them out below. That’s right. Less than $50 a year to keep 10 websites free of spam. If that’s not worth it I don’t know what is. AntiSpam did a pretty good job, even if it did miss a few instances of spam. The Analytics and Log sections work great and are very easy to access and monitor over time. They even send you a weekly report via email just in case you forget to check it that week. As I mentioned above, the price for a single site’s year-worth of anti-spam is peanuts. Even if you’re just running a small personal blog, $8 a year will not be a high price to pay for anyone. If you want more users’ opinions regarding this plugin just check out these reviews from the WordPress plugin repository. They speak for themselves. So whatever site you run, head on over to the WordPress plugin repository and download your two week trial for free.